This isn’t a review post or anything like that, I’ve simply placed an order for it today. I’ve recently been so hyped and into the videos for the different games on the Vive and I couldn’t take it anymore. This month, I will be using my PC for virtual reality. It’ll be in the mail within the next week or two so definitely keep an eye out for VR related posts sometime this month! 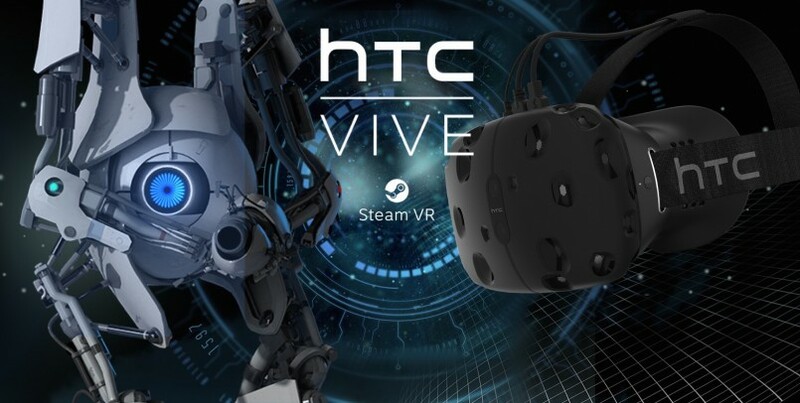 Right now there is a special promotion going on where the Vive comes with three different games: Tiltbrush by Google, Job Simulator and Fantastic Contraption. I’ve seen plenty of videos on these games and many other titles and I know that I’ll also be purchasing many other titles such as Hover Junkers and Raw Data. It took me a good while to finally decide that I was going to go with the Vive over the Oculus Rift but with all of the complaints about orders and with Oculus taking forever on the Touch controllers… I really just don’t want to wait anymore. The Vive is here and now, the reviews for it are super good and I’ve heard and seen nothing but a positive response from the controllers/tracking of everything. Steam is also looking amazing as a future platform and it’s integrated with the Vive. Again, I’m super hyped for this and I’ll definitely be spending a lot of time in VR! From Tiltbrush to first person shooter games such as Hover Junkers… there are just so many ways that this technology could be used. I’ve even seen a virtual LAN party. Where you can sit with a screen in front of you in a virtual living room and if you have a buddy with you – you can look over and actually see what they’re doing on their screen! It’s called BigScreen and although currently in beta, it looks amazing. It’s free to download on Steam. I’m pumped for all of these future applications and what it means not only for multiplayer and gaming purposes but for media and how people will connect… this has already been the most inter connected time of all time and it’s about to get a whole lot deeper with virtual reality integration. 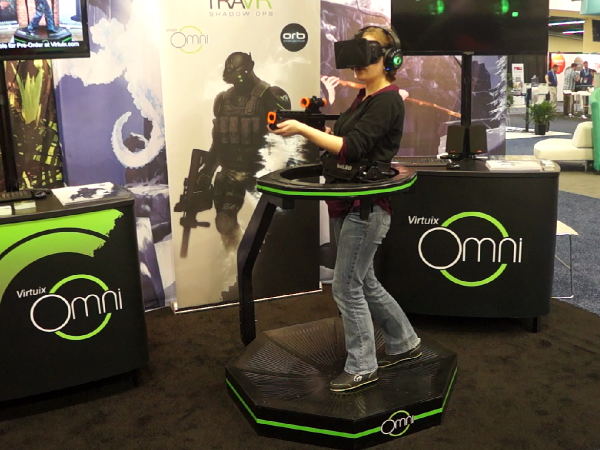 Then there’s also the thought of eSports and how virtual reality could get involved… have you guys heard of the Omni? I’m not saying that it’s the inevitable future of how movement will be done in VR but it’s hardware like those that will pave the way towards a virtual arena and competitive play for sure. VR is going to blow up. I know that there will be plenty of other iterations of these devices and I hope to someday own a wireless version of a VR headset and gaming device but what’s out today is going to be the closest thing and it’s always been a dream of mine to be apart of it. As I said, I’m not waiting any longer. The time is now for VR’s first wave and I’m going to be apart of it! Remember when the Xbox 360 first came out and it was absolutely revolutionary with the graphics and the first wave of games to come out? Then a year or two down the road those games were irrelevant compared to what had evolved? I believe that the same thing is going to happen with VR, Vive more specifically. Or are you going to wait for the future iterations of VR? It’ll be worth it in both ways in my opinion. Right now VR is super expensive, I paid over $800 for the Vive. Not everyone is going to have enough saved up to just jump right into the action so I can totally see how waiting for a future iteration of VR, maybe a less expensive and wireless solution, would be viable. So, are you just as excited as I am for VR? Do you think that it’s the inevitable future of all gaming? Tagged virtual reality, vive. Bookmark the permalink. I feel that VR will definitely be a cool, different way of gaming for the future, but I still hope that it won’t take over the OG controller with joysticks and multi-colored buttons. Still, VR should be pretty cool in the future(read The Mortality Doctrine series by James Dashner[The Eye of Minds, The Rule of Thoughts, The Game of Lives], they give a pretty cool sense of what it could be like). I hope the same thing Merritt, I know that traditional gaming methods will still be developed for many many many more years to come. The technology is just starting and the market isn’t really all the way there yet for all developers to focus on it but I believe that will change in the future… VR is only getting better from here on and it’s only a matter of time until the cost is down to a fair amount, enough AAA dev teams are working on it and the technology is 100% there to be fully immersed. I’m talking with things such as the Omni combined with headsets like the Vive. It’ll be a while, but man it’s exciting to watch it all unfold! Imagine VR eSports! !